Dough: Melt chocolate and butter over steam. Whisk eggs with sugar until the foam and add the flour and cocoa powder and mix it thoroughly. Stir in the dough melted chocolate and butter and pour into a mold with baking paper. Bake in a preheated oven at 180 ° C for about 20 minutes. Cream: Crushed the Oreo in a plastic bag so, that they remain large pieces. Mix the cream cheese with yogurt and sugar. Dissolved Gelatin in hot water and mix it with cream. Add the crushed cookies and coat the cream to cool dough. Put the cake in the refrigerator for several hours. Decoration: Oreo cookies get in half and remove the cream. Crush Oreo in the mixer and sprinkle cake. Milk, vanilla sugar and cream powder mix it on hard foam. 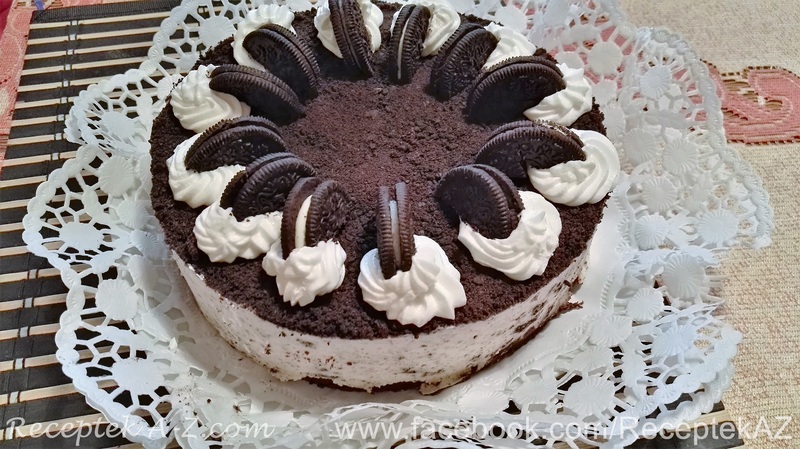 Decorate Cake and with the remaining six pieces of Oreo carefully cut in half and place on cream hills.